Word scramble puzzles really are word unscramble puzzles. 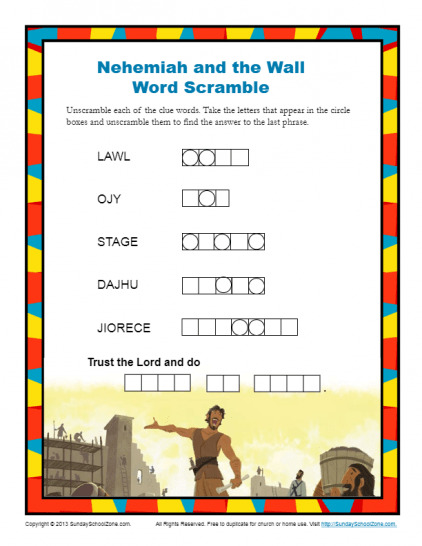 The word scramble activities below highlight various Bible events and situations. Click on the title of an activity to be taken to a web page where you'll be able to download it. In Mark 12, we read the story of the poor widow’s offering. In this story, Jesus was more concerned with the spirit of her gift than its size. This Jesus Taught About Giving Word Scramble will help kids remember that God wants us to be cheerful givers. Noah trusted and obeyed God even though he did not understand everything God was doing or was going to do. 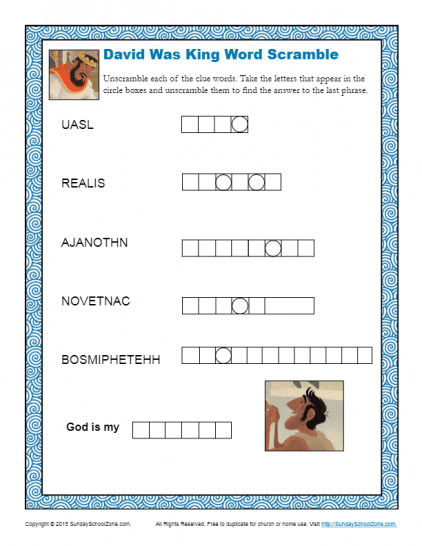 This word scramble activity will help kids understand the importance of trusting God even when they may not understand all God is doing. 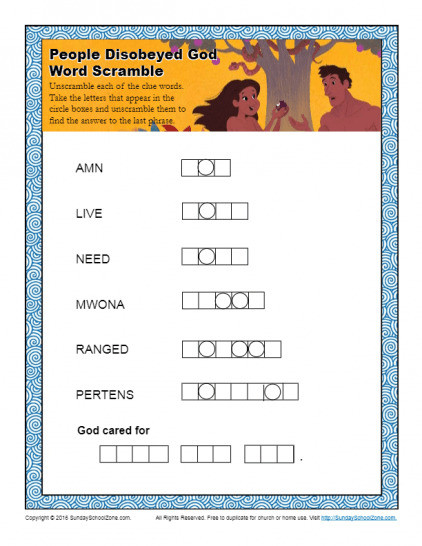 This word scramble activity, based on Ephesians 6:14, will help children learn that the Lord provides the armor and weapons we need to live our lives as He desires. 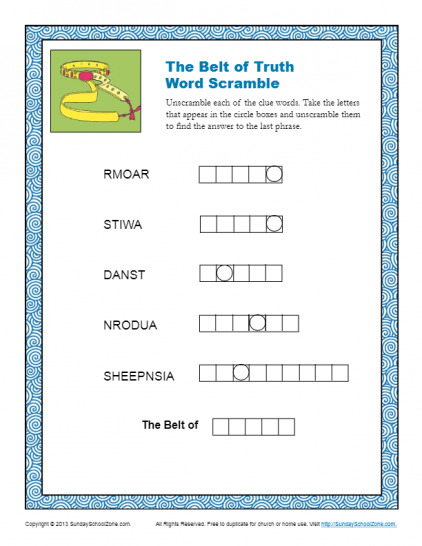 In this instance we are encouraged to treat truth like a belt. This is just one of the pieces of armor Paul describes in Ephesians 6. Elijah was used by God in a special way to show the nation of Israel that God is in control of everything, even the weather. 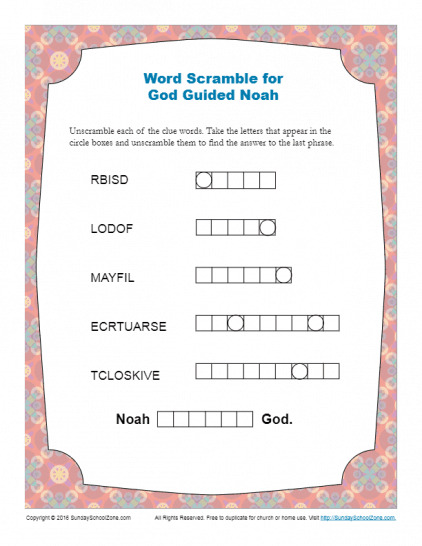 This word scramble activity will help kids learn to trust God and remind children that only God is in control of everything. 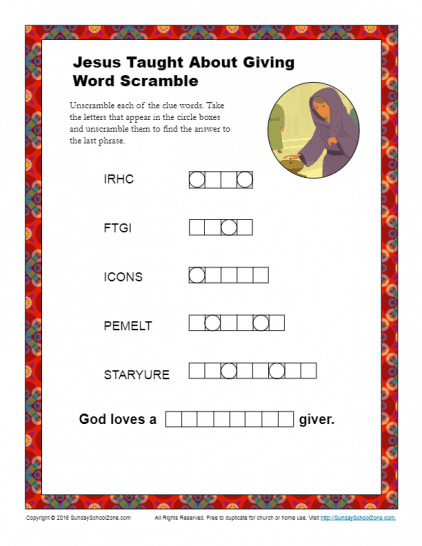 This free, word scramble activity, based on 2 Samuel 9:1-13, will help kids learn the value of generosity. It can be used in a homeschool setting, one-on-one, or in a classroom setting like Sunday School. Adam and Eve chose to disobey God. This word scramble activity shows them making that choice. You’ll want to remind your children that even though they’ve also done wrong, God still loves them, even though He’s very sad they didn’t trust Him. Abraham loved God and wanted to please him, but he also loved his son very much. In Genesis 22, God tested Abraham. 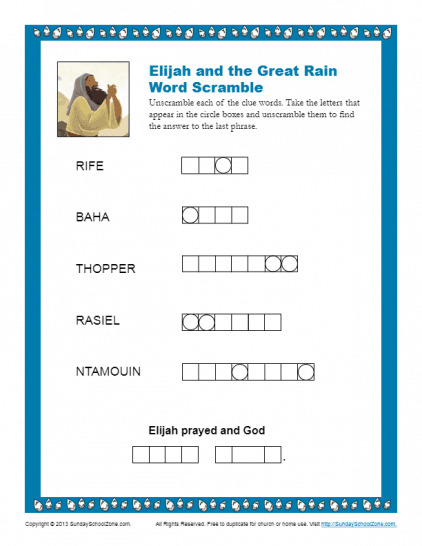 This word scramble activity will help children remember the important story of Abraham’s devotion to God. According to Genesis 4:1-16, when Cain’s anger got out of control he did a terrible thing, and killed his brother. 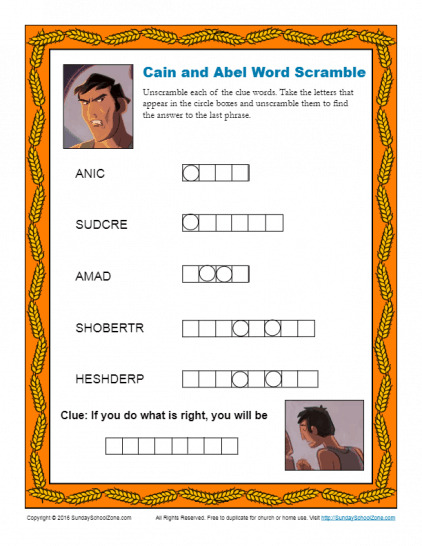 This word scramble activity will help children understand the importance of controlling their emotions and caring for their siblings.